Every season has it’s special scents and flavors. One whiff, one taste and you’re immediately transported to a favorite memory. That’s especially true for me at Christmas. Obviously, there’s pumpkin (nope, not letting that one go, at least not until after the New Year). There’s also the fresh scent of pine that fills my home courtesy of our brightly strung, decorated fresh pine. And of course, I can’t forget the comforting notes of warm, sweet eggnog and the occasional burst of tart cranberry. The warmth and coziness of these holiday flavors makes them perfect for baking, and if you think I’m crazy, I promise these two flavors pair together perfectly. Stir them into a yummy cupcake batter, and they’re a perfect treat for Winter. I mean, let’s be honest– when are cupcakes not great? A cupcake that tastes like one of my favorite seasons? That’s pretty dang amazing. Let’s take this experiment a step further though. 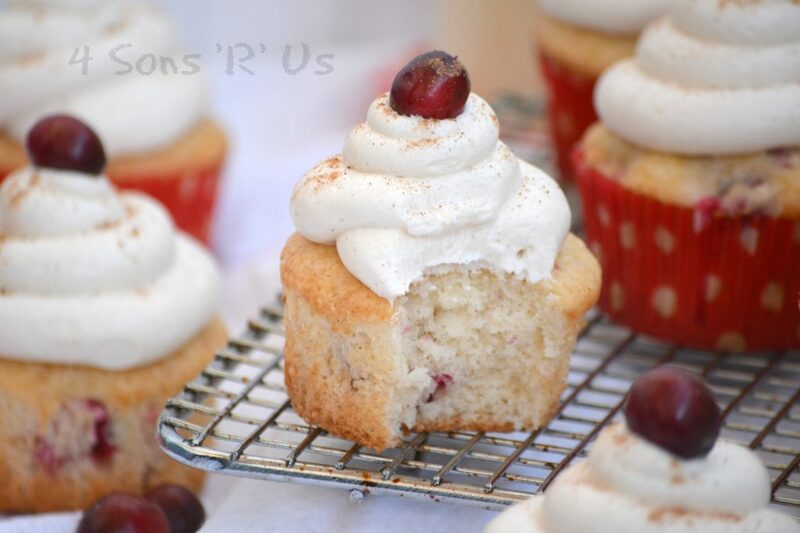 What if I told you that you could make one easy cupcake (yes, I really mean easy), pair it with a simple frosting (again, I am not exaggerating here) and every bite would literally taste like ‘Christmas’? Are you excited yet? 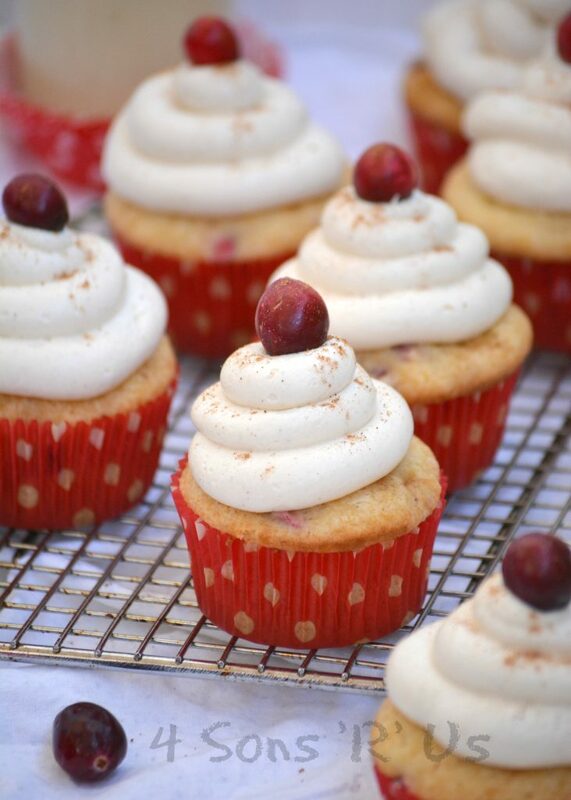 That’s exactly what these Cranberry Eggnog Cupcakes with Spiced White Chocolate Buttercream Frosting deliver. Embrace your favorite flavors of the season by incorporating them into your baked goods. Yummy, yummy baked goods. Cupcakes to be exact. 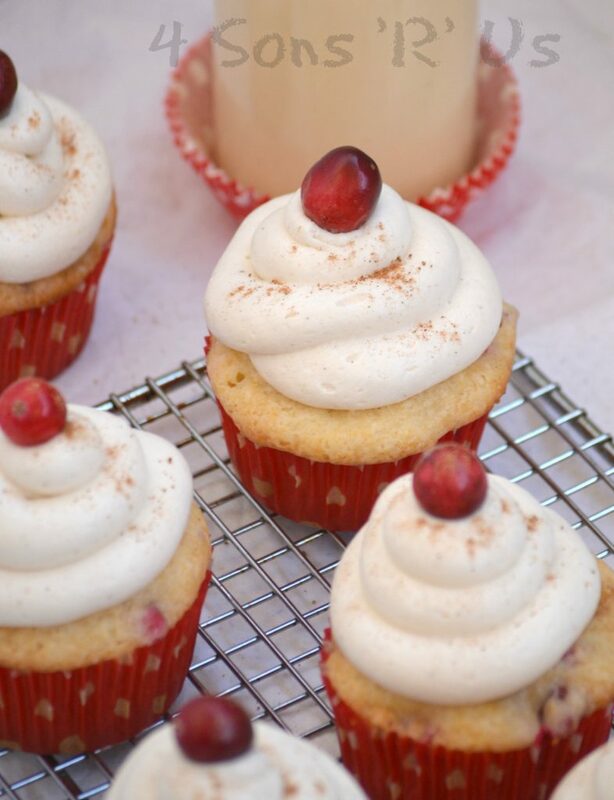 And while frosted cupcakes are good all by themselves, tart cranberries and cozy eggnog stirred right into the batter make them a warm treat featuring the two main flavors of the holiday season. Topped with a spiced butter cream frosting that’s been whipped with melted white chocolate? Then you’ve got a dessert that’s literally made with Christmas cheer baked into every bite. 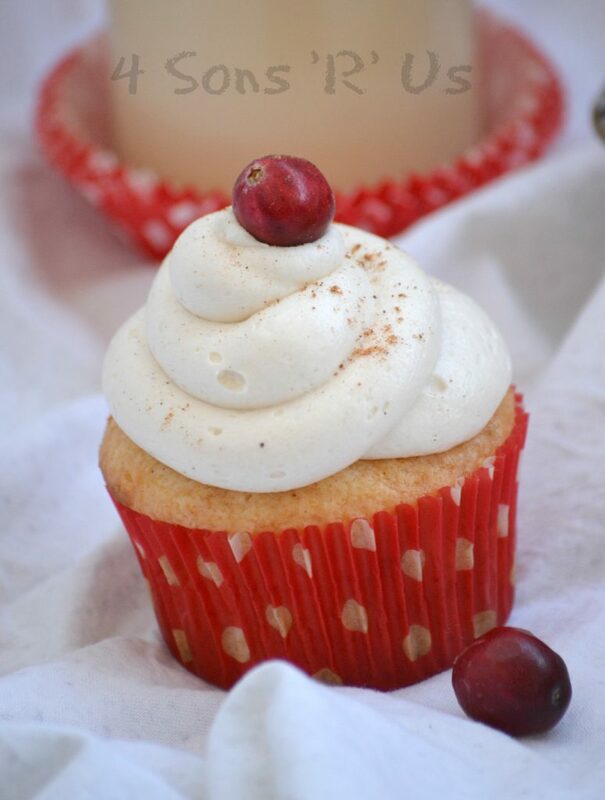 Share a batch of these Cranberry Eggnog Cupcakes with Spiced White Chocolate Buttercream Frosting with friends an family this year– they’re unforgettable and a great way to make a new memory! 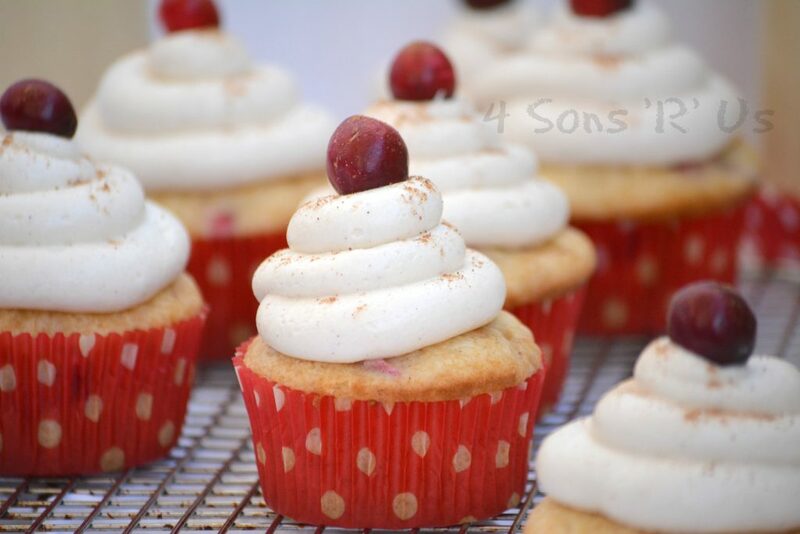 A yummy cupcake that takes the flavors of Christmas and runs with them. Seriously, it's like taking a bite out of Christmas, and actually tasting it too! In a large mixing bowl, stir together the cake mix, egg whites, canola oil, and eggnog just until the mixture's smooth. Gently fold in the chopped cranberries, cinnamon, and nutmeg.= until evenly incorporated. Spoon the batter into 24 cupcake liners and bake at 350 degrees for 18-22, minutes or until a toothpick inserted in the center of a cupcake comes out clean. Using a double boiler, melt the chocolate chips or wafers, stirring constantly until completely melted and smooth. Remove the chocolate from heat and let it rest/cool for a few minutes. In the bowl of a stand mixer, whip together the softened butter and the softened cream cheese, until evenly combined and fluffy. Reduce speed and whisk the mixture while slowly pouring in the white chocolate. Whip the mixture or another minute to get it fluffy and evenly incorporated. Add the powdered sugar, vanilla, spices, and eggnog. Beat for 2 minutes. Refrigerate the frosting for 1-2 minutes to 'firm' up. Sprinkle with a little additional spice, and top with a fresh cranberry, if desired. Now these are the kind of cupcakes I could really sink my teeth into! Happy Fiesta Friday! These cupcakes seem to have all the flavors of the holiday and they look so festive! Thanks for sharing them with us at Fiesta Friday!